This chart can be inserted into just about anything and is a great way to add some pizzazz to a plain sweater, T-shirt or washcloth. Or what about several of them in different colors repeating over a snazzy baby blanket? The original chart has the motif picked out in beads -- alternatively you could use a different colored yarn to knit it onto a plain Stockinette Stitch background, or stitch it on with Duplicate Stitch later. It it used to good effect in my Classic Little T-Shirt for kids. Also, you can work the motif in Reverse Stockinette Stitch or Seed Stitch on a plain Stockinette background. 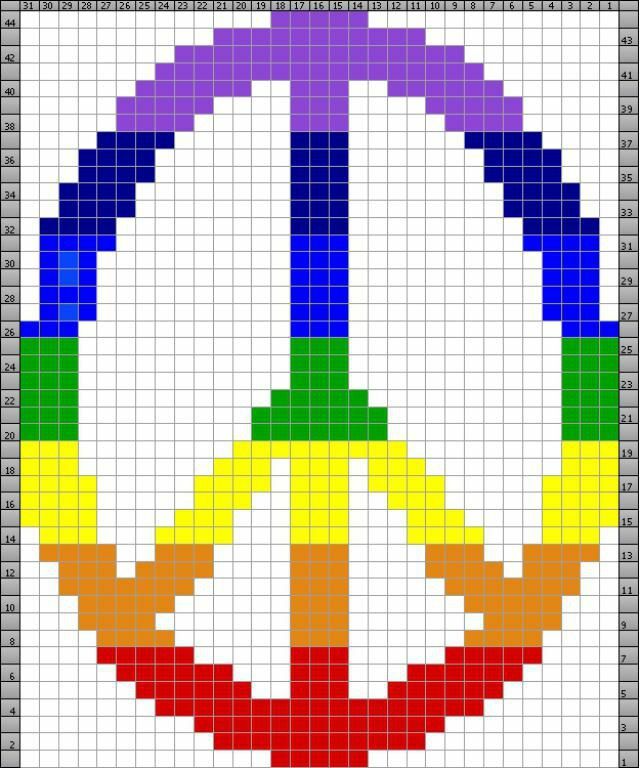 Above is the Peace Sign worked in intarsia stripes by changing colors where indicated on the chart.